If you are an American-born citizen without a foreign accent, going through airport security is probably annoying. Without toothpaste or your own water, how could it not be? But if you are a male between 16 and 50, from a country on Homeland Security's special registration list, things get much more invasive. 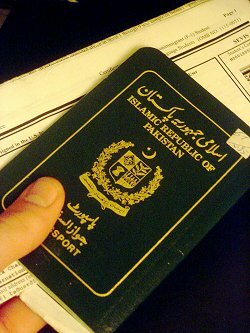 I'm Pakistani, and 21, facts that put me under a cloud as far as the U.S. security apparatus is concerned. Special registration, a provision of the anti-terror U.S. Patriot Act, requires citizens from 25 mostly Middle Eastern and Muslim countries to be questioned, photographed and fingerprinted each time they enter or leave the United States. (North Korea is the only non-Muslim country on the list). While most people who fly into JFK proceed quickly to the baggage claim and on to their reunions, my journey is different. I'm escorted by a guard, paperwork in hand, to a small room beside the immigration kiosks. I think of this as the Other Room — a sort of purgatory where those who might not be welcome in America are kept until they may (or may not) be deemed suitable to enter. Ambient beeps and rings compete with a baby's cries. The room is set up much like a classroom, with rows of grey plastic seats. Some 50 people, mostly families, are crammed into the seats. Many of the women wear the hijab, the traditional Muslim head covering. Men sit upright next to them, straining to hear their names. At one end of the room, there's a large, raised desk with four computers, manned by two uniformed guards — the only blondes in the room. A man speaks animatedly in Arabic to a woman next to him. "Keep it down, sir," says a guard to the man, who is dressed in white robes. The traveler looks at the guard for a split second and then sinks silently into his chair. My Pakistani friend Salman Toor told me of a similar experience. As he sat in this room, waiting to be cleared for entry, a guard looked up from his clipboard. "Take that hat off," he said, Toor didn't reply. "Take that hat off or you will be deported," said the official. Toor took off his hat. These are not isolated cases of disrespect. That registration based on religion exists at all — according to a study by the Asian American Legal Defense and Education fund, almost 95 percent of those registered were Muslim — is tantamount to a verdict of "guilty" clumsily stamped over an entire faith. It spells out that the U.S. Constitution, bursting with pride over concepts of "freedom," applies mostly or perhaps only to a certain type of person. And to suspect that anyone coming from 24 Muslim countries could be a trigger-happy extremist is, frankly, naïve. The men charged in connection with the plot to bomb a series of flights from Heathrow Airport in London, for example, were British citizens who would sail right through customs — and never be stuck in this room. I wait. And wait. I've been sitting here for almost two and a half hours. A woman with long streaked hair and large dark glasses shouts something about a connection. "That's not our problem, ma'am," she is told. Special registration often leads to delays or missed connections, either because of bad computers, faulty programming or overcrowding. Homeland Security informs you that it takes no responsibility for the inconveniences it might cause. We go through a similar routine on the way out. What it is, I think (I have plenty of time to think) is gratuitous ethnic profiling. Rules like this belie President Bush's famous claim that the war on terror isn't in a religious crusade. It feels like it is. I hear my name, and finally get to walk up to the desk to register. I'm fingerprinted and photographed for the second time. The guard asks where I come from, and where I am going. He asks if I have any bruises and if I'd been to a terrorist camp. He asks if I have terrorist connections. He asks where my parents are, what they do, how old they are. He asks if I plan to marry a U.S. citizen. He asks where and what I am studying. He asks why I went to Pakistan, why I left and what I did there. He asks my views on the registration process. He asks my views on the war on terror. And he asks when I plan to leave. There are worse things than giving up your toothpaste. Komail Aijazuddin is a senior at New York University, where he is pursuing degrees in journalism, art history and studio art. He is co-editor of Brownstone Magazine, NYU's journal about minority issues. This article was first published on NYU Livewire, a biweekly service supplying newspapers and magazines with feature stories about and for young people in college and their twenties.